We gather in the teepee yet again, this time to honor our ancestors and ask to feed and be fed by the living legacy of this northwest coastal region. 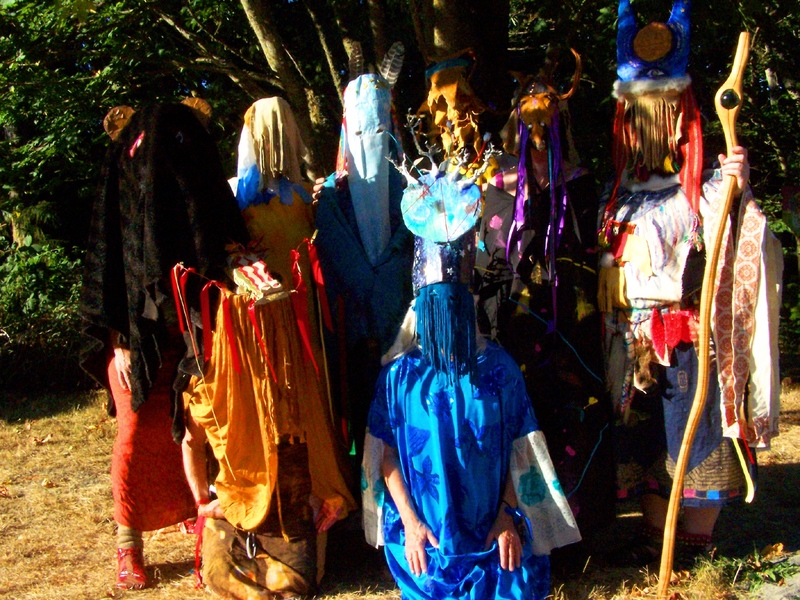 We will call to the spirits to animate our masks and to help us embody the beings whose stories need to be told. Already dressed in our costumes , we prepare to put on our masks. But wait – this makes no sense. We’re putting on masks to expand our experience of our selves… How can that be? Don’t masks hide our true identity? Don’t I, don’t we wear masks every day? My Mother taught me to put my best foot forward, whatever that means. When I was young, she suggested I bleach my hair to make me more attractive, wear rouge and mascara to make myself pretty, as if my DNA hadn’t made me pretty enough, match my sweater to my skirt and wear matching socks. And though I fought it, I also complied to the best of my ability, whatever that means. What are these false faces that we wear everyday? An attempt to keep the world engaged with me, that’s what my mask is. Pimples and smells, creamy colored teeth instead of snow white, any deformity at all and even simply being plain don’t cut the mustard. Habits of personality have frozen our faces into certain configurations. We are all petrified versions of our natural spontaneous and warm hearted selves. Luckily, my sagging face has lots of laugh lines but for many, disdain, anger, fear and depression have left unappealing tracks. I never even knew I wore a mask – until it fell off. Like mosaic shards crumbling off an old stone wall, my face shattered on the ground at my feet. There was a replica underneath that sort of looked like my old face but with more vulnerability, more realness. I burst into tears of shock. For hours I cried. Each heaving breath brought a sense of new possibilities and I became aware that I was undergoing an unbidden, uncontrollable deep cleansing of old cultural and familial habits of thinking about myself. A blessing! So the mask of propriety and perfection is one kind of mask many of us have been taught to wear in our modern, urban world. There are myriad variations – pretending to be fine when we’re not, of being nice when we’re not feeling very generous or kind, of looking 25 when we’re 55, of saying what we think wants to be heard not what we really want to say, all false faces that dishonor our souls, hide our authenticity. Then there masks worn by both hero and villain. Robbers, rapists, the lone ranger and superman all hide their identities behind the mask. But today, the masks we are about to put on our faces reveal our deeper/wider selves. Masks crafted with the help of invisible energies and expansive ideas, masks which stretch our limits and enlarge our sense of self… revealing aspects of ourselves that we didn’t know belonged to us. These masks allow us to be more fully who we are and in service of something larger than our short lived selves. It is these masks which we don now. This entry was posted in truth and tagged authenticity, false faces, masks, northwest coastal region, pretense, propriety, urban culture. Bookmark the permalink. The cultural masks we learn to wear are an important part of living together compatibly; extending courtesy when we may not be feeling courteous, minding the manners that our grandparents taught us, and yes, even to dress and look appropriate. These seem to be the basics of belonging. The basics to avoiding a collaps of our social network. Many of us, me included, learn all too well how to fit in. Individuality was not encouraged in my house while growing up and so I became completely identified with my persona…well mannered, pretty and unable to say “no”. It was all I knew of how to be. It was how I functioned in the world. Gratefully Spirit/Life would later play interference and bring me two near-death experiences that would finally wake me to the greater reality (I was a tough nut to crack) and I would come to study under the guidance of a Jungian therapist. Early in my seven year journey with him I had dug my heels in when it came to dropping my persona in order to find a bigger Self. So, once again, Spirit stepped in and brought a horrific “accident” that literally tore my face up. I took thirteen stitches to the face along with astonishing bruising, a broken vertebra and a wholelotaroadrash. In short, my persona was ripped away FOR me. At first I wanted to hide my face but was gently encouraged not to. Therapy took a profound turn and I eventually strode down sidewalks and into busy airport terminals with…..pride. I was wearing a new mask because I was so unrecognizable behind the cuts and bruises. I came to feel as if I wore the mask of the warrior because behind it, where no one could see, I was fighting for me. The greater me. I was still indentifying with my face but at least I was more. Then Spirit/Life brought a mask maker onto my path who taught me to make a mask out of a plaster cast of my face. I painted dream images all over that mask. I became “in awe” of my Self as I looked at it and “took it in”. Time, hard work and three more masks in the course of the following six years, with the help of my therapist, would bring me a Life I could only have dreamed of. Literally. Today I have many faces that still amaze me. I have learned to choose the one necessary or desirable in the moment without sacrificing propriety OR Self. I have learned the dangers of over-identifying with any one face and that these faces have no real edges, no definable beginning or end. That means that I participate in this space and this face with you; the you that is God so that God may know itself. Oh my Shannon, this is a rich reply. Taking in the awe of your own Self. You say that so beautifully and I wonder about all the people who say they don’t know who they are…what they care about, what they like and don’t like…if only we would value creative exploration and dream work the way you have…what a different culture of humans we would be. thank you for sharing.